ABOVE Got shore break? Oliver White takes a deep breath—or three—as he battles an Indo-Pacific permit through crashing waves. This tug of war ended well, but not without White being swept off his feet a couple of times in the process. A pronouncement that you’re going flyfishing in Oman usually elicits a “that sounds rad,” followed by a lengthy pause and finally a quizzical, confused expression. “Wait—where is Oman again?” And that, for the geographically challenged (which, let’s be honest, is most of us) is an entirely legitimate question. 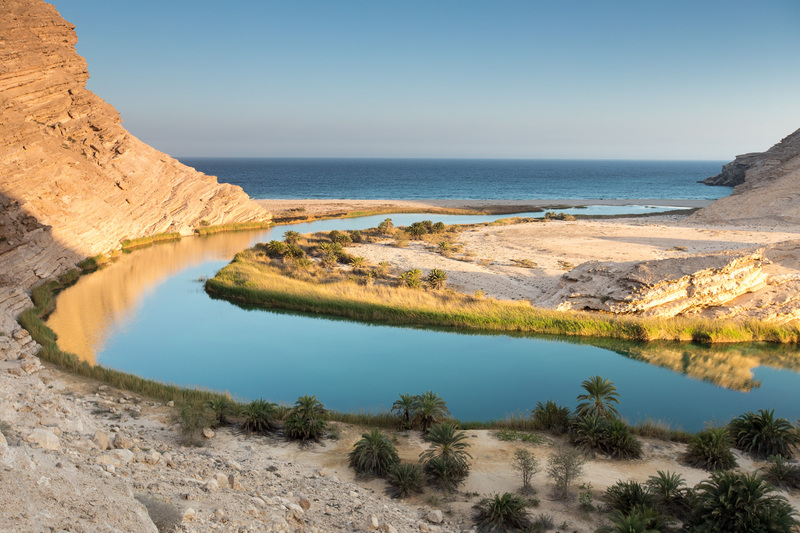 above Oman offers loads of tantalizingly beautiful and fishable water. Oliver White scans the great blue expanse for cruising candidates. Located on the southeastern coast of the Arabian Peninsula and bordered by Saudi Arabia, Yemen, the Arabian Sea and the United Arab Emirates, Oman is a fishy little diamond in the Middle Eastern rough. While Oman has long been a hot spot for tourists from the Eastern Hemisphere, it is just now beginning to see more visits from Westerners. 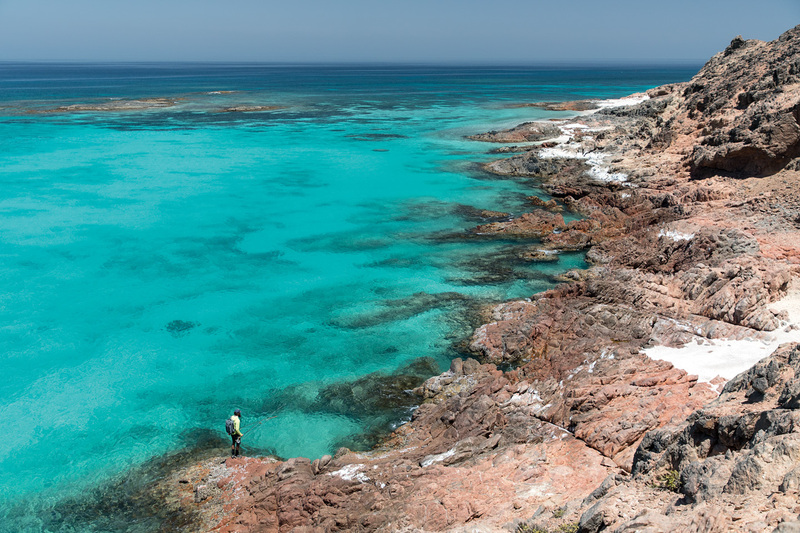 Among them are anglers looking for a less-frequented location to fulfill their saltwater dreams. Our small crew consisted of angler Oliver White, owner/operator of No Boundaries Oman; Ed Nicholas and a host of different guides each day. I carried with me a number of preconceived notions about this trip. True: Oman is quite warm. If you’re not already familiar with what it feels like to drip sweat from every pore while engaging in “angling activities,” you will find out very quickly. False: All Middle Eastern countries hate Westerners. We were warmly welcomed by the locals everywhere we went. There was no pretense, no prejudice and no sense of danger whatsoever. above What this image doesn’t show: massive rollers bouncing off the shore and causing me to dig deep while casting for bream. It ain’t easy, but it also ain’t Kansas. above With no other alternative, we gave in to dragging and pushing this impossibly heavy “tinny” across a couple hundred yards of beach from a freshwater wadi to the fabled waters of the Arabian Sea. Who says flyfishing isn’t good cardio? As for the fishing, we had very little to go on, which is a large part of the allure of any exotic fishery. Based several hours northeast of the southernmost Omani city of Salalah, we spent a few nights camping at a remote wadi rumored to hold sizeable fish. 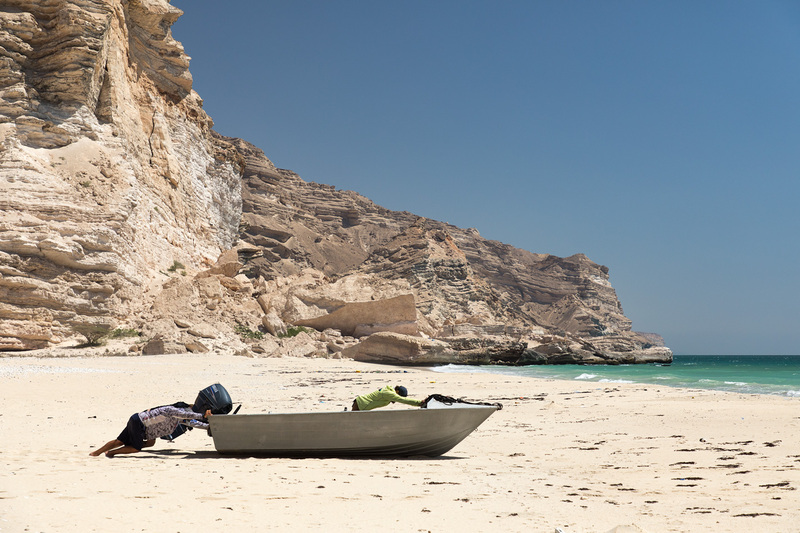 The stargazing was all-time, but the fishing left something to be desired—not to mention the daily grind of wrestling a sturdy aluminum dinghy across several hundred yards of Omani beach. 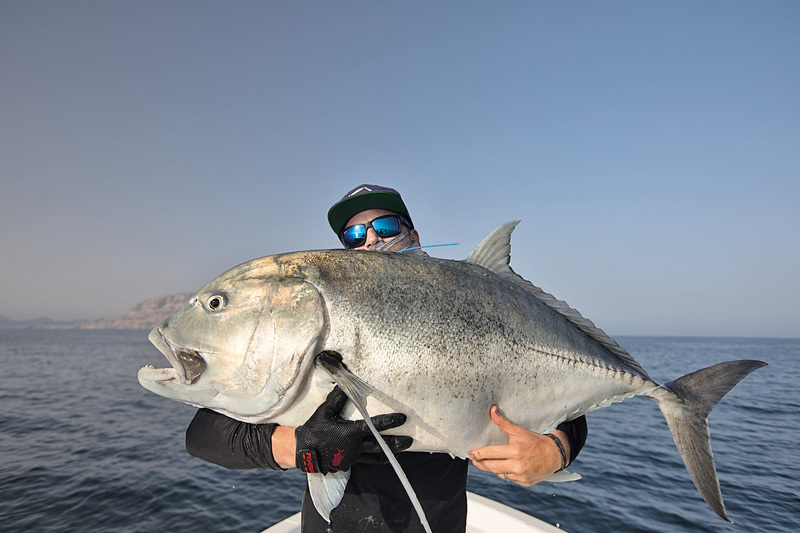 If there is one feather firmly tucked in Oman’s cap of angling offerings, however, it is a sure shot at monster giant trevally. Within the first 10 minutes of sinking a hand-sized fly into the depths of the Arabian Sea at one of Nicholas’ favorite hot spots, White was hooked up to a finned freight train. I wish I could tell you we showed that fish who was boss, but it was quite the opposite. With GTs routinely breaking the 125-pound mark, 12-weight graphite and 100-pound mono were akin to entering a gunfight with a toothpick. We decided our luck—and backs—would be better spent plying the beaches of several islands located an hour’s run from the lodge. above After promptly taking measurements and tagging this “baby” GT, No Boundaries Oman owner Ed Nicholas gets a quick bear hug in before releasing it. As is the case with most saltwater fisheries, we didn’t find flyfishing 101, but lurking beneath emerald water and crashing shore breaks were Indo-Pacific permit, emerald parrotfish and numerous species of wrasse. We also had legitimate shots at monster milkfish. 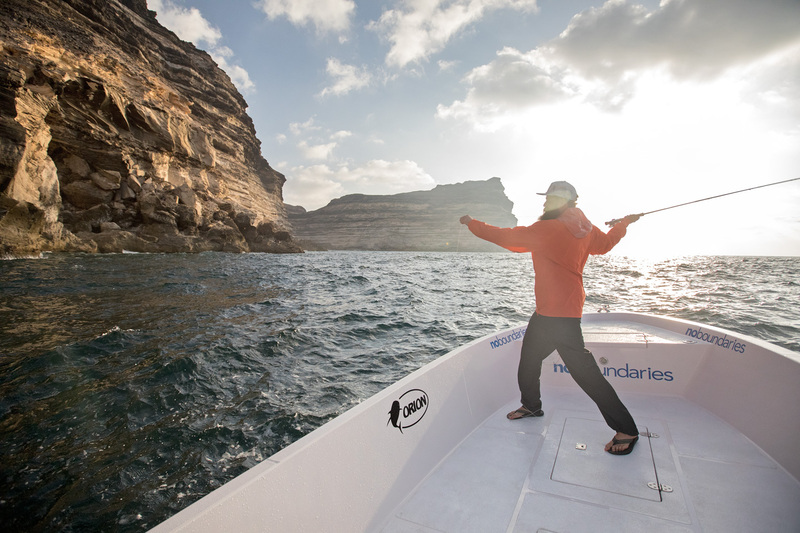 Oman still holds a hefty dose of the unknown when it comes to flyfishing. As with most trips of this nature, it is less about the fishing and more about the people, the place and a part of the world we rarely see. That sounds like the terrible moral to your (least) favorite short story, but it is entirely true. Go hungry for discovery and know you’ll leave after indulging in a full menu of culture, kindness and ravenous fish that have rarely, if ever, seen a fly. With GTs routinely breaking the 125-pound mark, 12-weight graphite and 100-pound mono were akin to entering a gunfight with a toothpick. above Affectionately dubbed “Wadi Wow-Wee-Wow,” this idyllic corner of coastal heaven served as home base for several days as we plied both the waters of the wadi and the Arabian Sea in the distance. If you look closely at the upper right corner, you can see the stretch of sand that had to be negotiated with our small aluminum boat to fish the ocean. clockwise from top left Getting cheeky with the Shuwaymiyah locals. 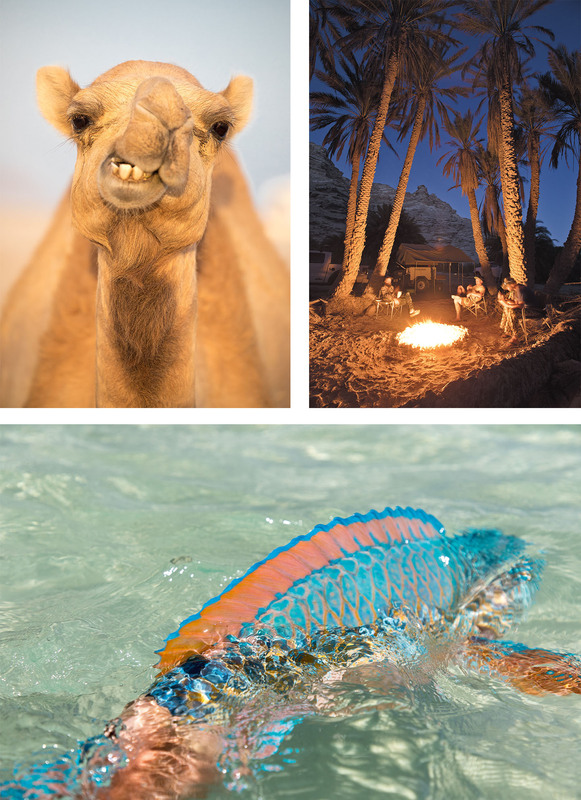 Anglers in Oman can count on seeing numerous camels roaming both the village streets and remote deserts. A night spent eating dinner and recounting the day’s stories under swaying desert palms. You’d be hard-pressed to convince me it gets any better. Notoriously difficult to hook, and even harder to land, parrotfish present an exceptional challenge for any angler. It’s only fitting to take a moment and soak in the otherworldly color of this emerald parrotfish before its release. We hooked into several of these fish, but this was the only one we touched. 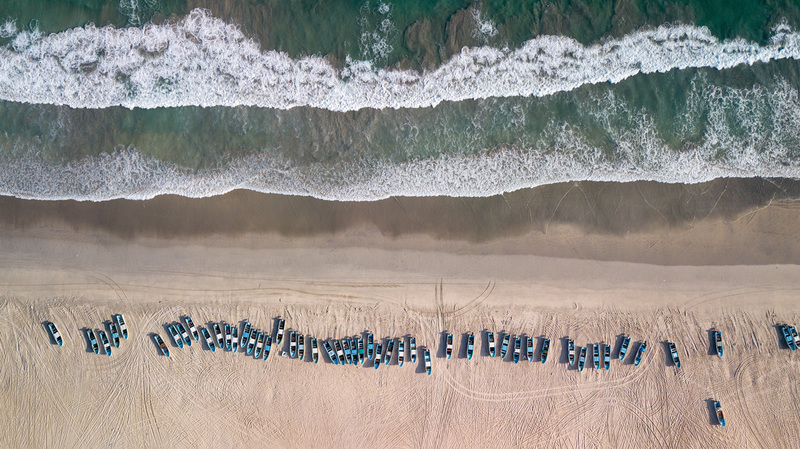 above Pangas sit neatly on the beaches of Ash Shuwaymiyah, dry-docked after a day of commercial fishing. During the high season, you can watch hundreds of these boats, packed with Bangladeshi fisherman, as they cruise in at day’s end and rocket straight onto the beach at full speed. This article was originally published in Volume Nine, Issue Four of The Flyfish Journal.